The past two weeks have been quite eventful for myself. After seeing 74 games through 13 weekends of high school football, I ramped it up a bit with 25 games in 10 days on a trip through the midwest. The trip started on Tuesday, November 18th and finished Sunday, November 30th. In between, were: 3,011 miles of highway; 11 states; 24 state championship games in 4 states; a Thanksgiving Day game in suburban St. Louis; and, a lot of fun. I’ve planned a trip along these lines for several years. This year coincided with two things: the Browns were on the road both weeks, and the schedules worked out well. In previous years, the Minnesota State Semifinals were held the week of the Iowa and Wisconsin state championships. All 12 games were at one venue. With the addition of 6A in Minnesota, the schedule now has the Iowa, Minnesota, and Wisconsin championships on the same weekend. I had previously been to the Wisconsin finals at Camp Randall Stadium and wasn’t thrilled with returning. I had never seen a championship or playoff game in Iowa and decided to see the three Thursday games in Cedar Falls, IA’s UNI-Dome. A short drive north to Minneapolis and there was four games on Friday and three games on Saturday at the recently opened TCF Bank Stadium. The former home of the Vikings has been razed and their new stadium is still over a year away from completion. Now, this is where this trip plan works out. Nebraska, due to scheduling games throughout the week for the playoffs, hosts their six championship games at Memorial Stadium in Lincoln on Monday and Tuesday before Thanksgiving. This allows a one-day transit from Minneapolis to Lincoln on Sunday to catch some more games. The other option, then, is which games to see in Week 14. Illinois and Michigan both host 8 games over two days at Memorial Stadium and Ford Field respectively. Missouri, however, hosts 7 games over two days. Given that I had attended the Michigan games last year, and I had yet to see even see a high school game in the Land of Lincoln, I opted for Illinois. The Missouri games would have been interesting, but I wanted a slightly shorter drive for Suday to return home. Then there was the surprise. While scouting out this trip, I discovered that Kirkwood (MO) and Webster Groves (MO) still play a game on Thanksgiving Day every year. In years their teams fail to qualify for the state championships, the game is a varsity contest. If either team is playing in the state final, then it’s a Junior Varsity game. As luck would have it, for me anyways, both teams lost and made it a varsity game for the second straight year. With an afternoon game on Thursday, an evening drive to Champaign, Illinois wasn’t an issue and added one more game to the ledger. First, I’m not going to recount each and every game. However, I will give some insight into other states and their setups. Also, detail some of the more intriguing or exciting finishes. First, was the IHSAA hosting their six championships at the UNI-Dome in Cedar Falls. Now, this venue is most definitely not central to the state (Des Moines or even Ames would be), however its benefit is two-fold: it’s a climate controlled dome, and it’s reasonable sized for the games. Seating for about 15,000 was more than plenty. Now, I was only here for the Thursday games, I’m sure Friday’s action was similarly setup. Tickets are sold for $10 per session with no in-out privileges. The games are broken up each day into two sessions. The first session started on Thursday at 10:06 AM and included two games. The second started at roughly 1:06 PM. The second session was a single game that started at 7pm. This allowed ample time to go eat and relax between games. This meant someone wanted to see all six games would cost $40. Also, the university provided lots (which were the only things in walking distance) were $5 per day. But they did allow you to leave and return as long as you showed your parking pass. Programs for the championship games were a reasonable $4 for a very nice program. So, total cost for all six games for two people would be: $94, or $7.83/per person per game. Iowa also hosts all 12 state semifinals at the UNI-Dome. This is a similar setup to Minnesota when the Metrodome was still around. This is a bit much for travel, but gaurantees the best game day for fans and players. Iowa has 5 levels of 11-man football and 1 level of 8-man football (they call it 8-player). However, the classification identifiers are a bit odd. They use the letter system, rather than number. And given then use only A’s for them, it creates an oddity no where else in the country has. From largest to smallest, you have 4A, 3A, 2A, 1A, and A. Technically, a state that uses the letter system with A would be called 1A, but Iowa already has a level they call ‘1A’. Why? Not entirely sure. Now, Iowa 8-Man is and plays on a traditional 80-yard field that is 120-feet wide, narrower than the 160-foot wide 11-man field. Iowa, though, only shortens the one end of the field in the dome. The south endzone is still marked appropriately. While the opposing 20-yard line is marked with yellow tape, and the space between the 20 and 10 yard lines are marked with angled white tape to denote the endzone. A temporary goal post is placed at the 10-yard line. The field is narrowed evenly from both sides, allowing the players and staff to stand out on what is traditionally the field between the regular sideline and the numbers. This also means the very large Panthers logo at the 50 now sits between midfield and the northern 20-yard line. And aother note, and this is apparent for al these states, is co-ops and combination teams. Especially the smaller the school the higher the likelihood of a co-op. Newell-Fonda and Tabor Fremont-Mills played a great 8-man game. Fremont Mills held a 29-20 lead going into the fourth quarter. But, Newell-Fonda took the lead, 33-29 halfway through the fourth. Fremont-Mills answered about a minute later to go up 35-33. However, Newell-Fonda scored on an 8-yard QB scramble up the middle with 7 seconds left to win, 39-35. After the game, it was interesting to watch them deconstruct the 8-man field to get ready for the A Championship game between Logan-Magnolia and Gladbrook-Reinbeck. Lo-Ma (as the fans called them), lead 21-17 going into the fourth quarter. A back-breaking 26-yard interception return for a TD by Gladbrook-Reinbeck gave them the lead on the first play of the quarter, 24-21. Lo-Ma went on a methodical drive late in the quarter and capped it with a 9-yard TD run on 4th & 2 with 59 seconds left to win the game, 28-24. After dinner at Texas Roadhouse, it was back to the Dome for the 3A finale. Bishop Heelan Catholic of Sioux City was taking on Pella from the rural areas southeast of Des Moines. The game wasn’t too exciting, and Pella pulled away late in the game, 35-17. After the game, it was a brutal drive north Minneapolis. Sticking around for the third game was probably a mistake as it wasn’t a great game, and it ran long into the evening. A stop in Albert Lea, MN for the night gave only a few hours to sleep before driving the last two hours to Minneapolis. Now, I had seen the 12 state semifinals back in 2010 at the Metrodome, so I knew a bit how the MSHSL ran their tournaments already. Previously, they just as Iowa did hosted all semifinals at the Metrodome as well. Due to the lack of the dome for this and next year, they were played at various venues around the state. The titles, though, were staged over two days at TCF Bank Stadium in Minneapolis. This stadium, home of the Golden Gophers, is a great venue for HS football. The state association allows in-out privileges with a wrist band before you leave. There’s ample places to eat. For Thursday, it was Buffalo Wild Wings across the street and for dinner was Jimmy Johns (faster than getting a table). The next day was Jimmy Johns for lunch and then dinner after the final game was over. The seven title games (they recently added 6A) were played with 4 games on Friday and 3 games on Saturday. Friday games started at 10am, 1pm, 4pm, and 7pm. Saturday games let out early, after playing at 10am, 1pm, and 4pm. This was nice, as the temperature dropped in the evening. Minnesota will use a district system similar to Texas next year. You play the teams in your district, and qualify for the playoffs based on those results. This is the last year of the old conference setup. One interesting factoid is that Minnesota plays several of their playoff games out of state. The reason is the same as the championships and the games in Iowa: Domes. Grand Forks and Fargo, North Dakota both hold a dome, and there’s no adequate venue in that region of Minnesota for those teams. So, they cross the Red River and make use of North Dakota’s venues. The Alerus Center and Fargo Dome also host North Dakota championships despite being within miles of the state line. Now, Minnesota, North Dakota, and South Dakota are the only states to play 9-man football. It’s not much different than seeing 8-man. Though the field is 100-yards long. They still play on a field as narrow as 8-man, though at 120 feet. The “Prep Bowl” games are scheduled in a staggered manner by class. 9-Man, 2A, 4A, and 6A are on Friday, while 1A, 3A, and 5A are on Saturday. Tickets are $13 for one day (with in-out privileges) for adults, or $18 for a weekend pass per person. This is, by far, the best deal. This gave you a wrist band that let you come and go for both days. The only problem is you’re either stuck wearing it all night, or do what my girlfriend and I did. Just show it on entry (both not put it on), and then get a regular wristband the first time you leave. You can remove that yellow one at the end of the day and still have the pink Prep Pass to put on the next day. Programs were quite extensive, and were $5. Parking on a stadium lot on the opposite end of the field from the main entrance was $4 a day. So, for two people seeing all seven games, was a total of $49, or $3.50/game per person. 9-Man opened with a blowout, as Grand Meadow crushed Edgerton/Ellsworth, 48-0. A rather rare shutout in the 9-man championship game. The second game of the day was one of the best of the trip. Holdingford & B-O-L-D (a merger of four schools) battled through a scoreless draw for the first 44:56 of the game before B-O-L-D scored on a 4-yard touchdown run. The kick wasn’t converted due to a bad snap. Holdingford moved the ball quickly, and with a running clock, from the ten yard line, the QB scrambled and ran into the endzone after the clock read 0:00. B-O-L-D, however, blocked the PAT to send the game to overtime. B-O-L-D opened the OT with a 9-yard run and scored on a 1-yard run on 2nd down. The kick then hit the upright. Holdingford then answered on the first play with a 10-yard run. Foregoing the very shaking kicking game, they elected to go for two. The run, though, was stuffed right at the goal line to send it to 2OT. In the 2nd OT, Holdingford on 4th down connected on an 8-yard TD pass and ran in the conversion to take a 20-12 lead. B-O-L-D answered right back on their second play from the 7-yard line by running it in. On the two point try, however, the QB fumbled the ball, and recovered, but the damage was done. Holdingford hung on to win, 20-18 in a game that was scoreless for almost 45 minutes. In the 4A game, Becker defeated local Minneapolis DeLaSalle, 24-6. DeLaSalle had the smallest crowd on the weekend. Being dwarfed by both 9-man crowds. And the marquee game of the wekeend was between perennial power Eden Prairie and Totino-Grace in a battle of Eagles. Totino-Grace led 21-7 at halftime, and 21-14 after three. A 23-yd TD pass on 4th & 16 tied it at 21 with 9 minutes to go. A 75-yard touchdown run with 3 minutes to go gave Eden Prairie a 28-21 lead after running off 21 straight points. Just a minute later, Totino-Grace answered with a 25-yard run. However, they decided to play for the win and not overtime. Their pass was incomplete. Eden Prairie then recovered the kick and held on to win a thriller, 28-27. After spending the night in downtown Minneapolis at the Crowne Plaza (definitely not worth the price), it was back for the kickoff of the 1A game. I had seen DeLaSalle and Totino-Grace back in 2010. And for today, were two more teams playing their second game I’ve attended. First up, was Minneota, who was playing Dawson-Boyd. A rather non-descript game that Minneota won, 28-14. Up next, was second-timer, Rochester Lourdes, who beat up New London-Spicer, 35-14 in the 3A game. 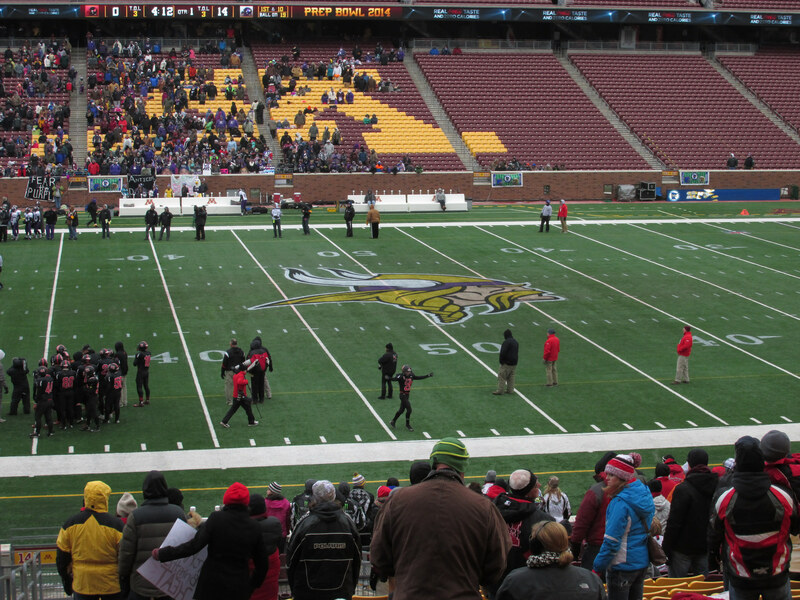 And lastly, was the 5A matchup between surburban Simley of Inver Grove Heights and Mankato West. The Scarlets of Mankato West won easily over feel-good story Simley, 42-19. After the game, we headed on a round-about way toward Lincoln, Nebraska. We stopped for the night in New Ulm, Minnesota. Sunday was a drive through the farmlands of southwest Minnesota and northwest Iowa to Sioux City. A brief stop across the river into South Dakota, and then south to Lincoln, Nebraska for the next leg of the journey. The nicest thing I can say about our hotel in Lincoln was that it was cheap. Opting for a hotel near the airport rathe than the more expensive ones downtown was a mistake. Walking distance from the parking lot to the stadium was about equidistant to the hotels downtown. And would’ve saved the $5 tab. I had already seen two games in Nebraska over the years. Grand Island hosted Lincoln East in 2010, and Norfolk hosted Fremont in 2011. I knew that Nebraska had a small 6-man league that wasn’t quite integated into the NSAA, however I didn’t realize their classification system included two 8-man leagues untl I was researching the matchups. Nebraska–as does Minnesota and Iowa–uses the lettering system for classifications. The largest is A, followed by B, C, and D. Both C and D are split into two levels, C1 & C2, and D1 & D2. Class D are 8-man games. As with Iowa, they play on an 8-yard field, however they bring in both endzones to make each 10-yard line the goal line. And also use what amounts to white duct tape on the field for markings. The scheduling for Nebraska is odd. Their titles are held on Mondays and Tuesday, and partly because of their use of mid-week games in the regular season. Class A, B, & C all finish their semifinals by two Saturdays before the finals. While Class D hosts their Semifinals on the previous Monday. This does avoid any possibility of the Nebraska Cornhuskers having a game the same weekend. The scheduling is also a little irritating. Games start at 10:15am, 2:45pm, and 7:15pm. Spaced just far enough apart that you can leave to do something, but not too much. With classes and work, a lot of the lots near the stadium are accounted for, and unless you’re a very early arriver, you will be sent to purgatory across the tracks on 10th. This is a long walk across a pedestrian bridge over a rail yard north of the stadium. And you get to spend $5 to do it. The schedule for games is D2, D1, and A on Monday while C2, C1, and B are on Tuesday. Tickets to each game are $7 each for adults. Nobody actually clears the stadium, and on the first day we were still in the seating bowl for well over an hour after the second game ended. We left, however a bit later. Apparently they open the doors again about an hour before kickoff of the next game. Programs were, again, $4 and were well worth it. So, total cost for two to see all six championships was $98, or $8.17/game per person. Between games we walked into the downtown area, which the stadium sits very close by. Between games, we drove to a phone repair shop, iRepair, on the east end of Lincoln. My girlfriend managed to break the screen on her iPhone and they replaced it in about 30 minutes for $118. Which was a lot cheaper and they were very fast. We ate across the street at a place called Cheddar’s. I’ve seen them before, but never stopped. Their food was phenomenal. Definitely worth stopping again. As for the games, Nebraska left us a bit wanting. 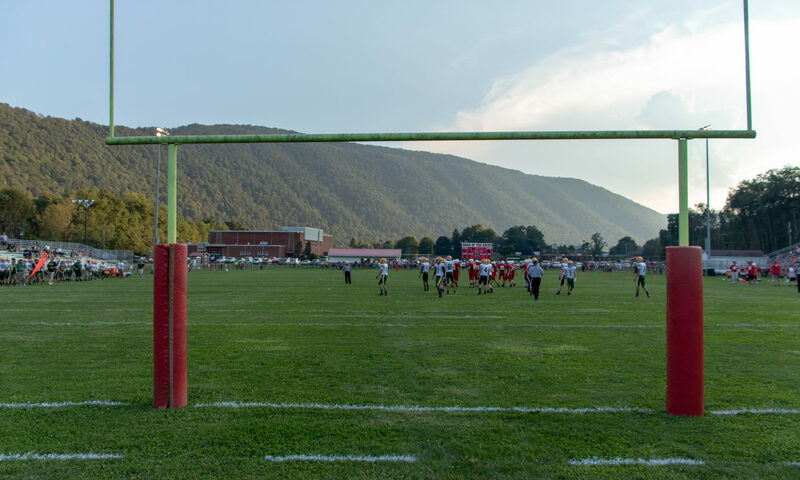 The best game was the first gmae, which was 18-14 after 3 quarters before Exeter-Milligan blew the doors off Anselma-Merna, winning 40-26 in a final quarter not near as close as the score indicates. As the weekend progressed, it was nothing but one-sided scores. After staying another evening at our hotel in Lincoln, it was on east to Webster Groves, Missouri. Included on this trip was side side-excursions, including visiting the last few counties of Missouri I had yet to be in. This was the first non-playoff/non-championship game of the trip. Thanksgiving morning, we started in Palmyra, Missouri and drove the two hours south to Webster Groves. The Webster Groves Statesmen and Kirkwood Pioneers have a 107-year tradition of playing on Thanksgiving. Only one of two west of the Mississippi River. If either team is in the state playoffs the following week, the game reverts to a junior varsity contest. Arriving early, the parking at the middle school was free. Tickets for this contest were a little steeper than most games, as they were $10 at the gate for everyone. Pre-sale prices were cheaper. A large crowd was expected, but the cold probably kept some away. However, a nice blanket of snow was on the field from the night before which made it quite picturesque at small Moss Field. Kirkwood won 44-0 last year, and won easily this year as well, 27-6. After the game, the Kirkwood students drove the Frisco Bell around in the back of a pickup back to their school, which was entertaining. Also, a side note, got to watch someone ram the back of a BMW in the line of traffic on the way out. And this wasn’t an accident, the guy kept doing it, squealing tires and pushing the BMW into the car in front of them. A police officer handling traffic came to confront the driver who finally stopped. Definitely an oddity. After a late Thanksgiving Dinner, it was on to Urbana, Illinois for the hotel and four games on Friday and four games on Saturday. Illinois has eight classifications, and operates similar to Michigan in the scheduling and setup. Four games are played on Friday and four games are played on Saturday. Games are held at one venue, and generally start at 3 hour intervals. Illinois regularly plays their title games at Memorial Stadium in Champaign. Due to the Big Ten expanding their season to go past Thanksgiving, the games now alternate between Memorial Stadium and DeKalb’s Northern Illinois. Unlike Michigan, though, the games are played in sequence. 1A, 2A, 3A, and 4A on Friday, and 5A, 6A, 7A, and 8A on Saturday. Michigan, however, shakes it up to ensure two big schools won’t be playing back to back to handle traffic and crowds. Illinois does two other things that are different: the private schools have a 1.65 multiplier, which explains their absense in the smallest classifications. And lastly, they don’t determine the classifications until after the regular season is over. The 256 best teams get broken up into 32-team pods from biggest school to smallest school. Parking is simple and quite ready accessible across the street by the spaceship-shaped basketball arena. It’s $5 per day, and you’re allowed in-out privileges, which was the same as Nebraska. Tickets were purchased at little kiosks located across the street from the stadium by the parking lots. The street between the two are closed to eliminate vehicular traffic will all the people crossing. Which is quite smart. Tickets were $10 each for the day and also allowed in-out privileges with a hand stamp and ticket stub. A $5 program was quite thorough except playoff histories were only for the past 15 appearances, and nowhere did it list tables on most wins, appearances, all-time championship record, etc. Total cost for two people to attend all 8 games was $55, or $3.44/game per person. Beyond the west sideline, was ‘Tent City’ which is setup for the participants and their fans. Pre-game and post-game meeting spots for the opponents. One big tent to get free water, hot chocolate, cotton candy, pretzels, licorice, and popcorn between games. Also they had a large flatscreen setup to watch the telecasts and a mechanical bull for fans to attempt to ride. Also, a radio station setup a remote location in the tent to play music and talk about the games during intermissions (was never out there during a game). Unlike Nebraska, Illinois had several really good games. First game opened with Forreston defeating Carrollton, 20-15. Second game was a little one-sided as Pearl City-Eastland defeated Maroa-Forsyth, 41-12. Third game was the game of the day. Wilmington and Williamsville were neck and neck all game. Wilmington took a 3-0 lead into the lockerroom. Williamsville tied it in the third. And Wilmington took the lead with a 61-yard touchdown run to make it 10-3 going into the fourth. Williamsville tied early in the 4th at 10-10, before WIlmington ran the kickoff back 92 yards for the touchdown to retake the lead, 17-10. 59 seconds later, Williamsville hit a homerun with a 65-yard touchdown pass to tie it again with 5:15 left. Wilmington then went on a methodical low-result drive before stalling out and resorting to a last second field goal attempt. The 32 yard attempt directly into the wind was good as time expired for Wilmington to win the 3A championship. The night game was a run away from Rochester, as they recorded their fifth straight championship, which broke the record of 4 held by a few school, 49-28 over Chicago Phillips. The next day provided more excitement with the final two games. First up, in 5A, Sacred Heart-Griffin defeated Montini Catholic, 29-14 and in 6A, Nazareth Academy defeated Lemont, 26-7. In 7A, Providence Catholic held on to win, 31-28 over Cary-Grove. And the final game of the trip and Week 14 was one I’ll remember for a long time. Stevenson (Lincolnshire, IL) was going up against Hopewood-Flossmoor (Flossmoor, IL). Stevenson was a slight favorite, but it was looking up to be a great game. The Hopewood-Flossmoor Vikings were down 24-16 entering the fourth quarter. The Stevenson Patriots was moving the ball well and scored again halfway through the 4th to make it 31-16. It seemd hopeless that the Vikings could comeback. After a long drive by the Vikings, they had the ball inside the 5 on a 4th and 2 with less than 3 minutes to go. After being stopped, it appeared over. Then, on the first play for Stevenson, the RB was tackled for a loss in the endzone to make it 31-18 with Hopewood-Flossmoor getting the ball back on a free kick with 2:18 left. In just 23 seconds, the Vikings stormed down the field, scoring on a 15-yard touchdown pass to narrow the lead to 31-25. Next up, was the onside kick. With the alignment Stevenson was showing, I thought a pooch kick over the two lines of the receiving team would give them the best shot at a recovery. Sure enough, they did a pooch, and the up-man mishandled the bouncing ball. Hopewood-Floosmoor recovered inside the Patriots 25 with under two minutes to go. Stevenson held strong on the and forced a 4th-and-2 at the 9-yard line with 55 seconds left. The Vikings setup their offense and an inside handoff broke through the line, across the line-to-gain before getting dragged down by three defenders inside the 5. The problem was they stripped the ball away and recovered it inside the 1 yard line. It was a sickening feeling on the Hopewood-Flossmoor sideline after such jubilation. It seemed destined for the monster, storybook comeback. Only to have it ripped out so coldly at the end. I’m sure that fumble will haunt the running back for the rest of his life. Just a few yards from the tying, and potentially winning score on the conversion, and instead it was Stevenson ball at the 1 with so little room they couldn’t even kneel the ball out but had to try and push the pile forward twice to win it. After the game, it was back to our hotel, before driving home on Sunday. Stopped to watch the Browns game along the way, which was a disappointment. As for the football, the states vary greatly. I always consider Ohio to be several steps above Pennsylvania on an overall comparison of equally sized teams. In this trip, I’d have to say it goes Illinois, Minnesota, Nebraska, and Iowa. Illinois being just about or just below Pennsylvania. Nebraska was almost last for me, but I give them the benefit of the doubt as I didn’t see all six Iowa games and I’m not going to speculate on how good their highest level might be. Nebraska, though, had no competitive games. Teams got out of rhythm quickly when trailing and it just wasn’t much of a game. Creight Prep lost to Omaha North, 41-0 in their big school matchup. And really showed no signs of life. Illinois was the clear favorite. As the classifications got bigger, the crowd size grew, except for the Chicago city school, but it was expected. Minnesota got high marks for the crowd showing up in such cold weather outdoors. Nebraska did well for the lower levels. Especially the distance traveled by Hemingford. Though the two Omaha schools were a little lack, but they both had to travel to Lincoln for a game that was expected to be one-sided, though not 41-0 in nature. The two schools are only a few miles apart, so I expected a rivalry. Iowa gets the bottom spot, again, due to a few factors: it’s a small venue to begin with and crowds weren’t large at all. Part could be blamed on the location of the dome, and the fact the semifinals were held there the week before. Also, it was Thursday. But, I’ve learned in fly-over country that work stops for football. The agriculturally based life-style lends itself to its own schedule. Not the M-F/9-5 mode. Wyoming, for instance, has a lot of schools that are 4-days a week with Fridays off. However, Iowa benefits from a dome. Greatly benefits. It’s a benefit Minnesota will reap once again in two years. Michigan already gets that in the games I saw last year. Crowds like to be comfortable. Hassle or discomfort equals: I’ll watch it on TV. Which, for all these games, was the case. Each state had their own television setup. And in most cases you could watch them online. As for venues, UNI-Dome gets to be ranked high because it’s a dome in Iowa. Minnesota’s TCF Bank Stadium is easily #2 due to age. It’s new. Though that mountain of stairs you have to climb from the entrance open for the high school games is a bit ridiculous. Then there’s the two Memorial Stadiums. Both have their old and new parts. But, I give the edge to Memorial Stadium in Champaign, Illinois. The stadium itself is more consistent and architectually sound. The east side is old, the bathrooms are old, etc. The west side is all new with a great concourse, bathrooms, etc. A huge press and luxury box tower sits on the west side. Memorial Stadium in Lincoln has a new side as well. But, it lacks in charm and aesthetics. Seating is piled up wherever they could squeeze more in. The endzones are monstrously unappealing viewing angles and dominate the field. The east side (new side), looks like it’s a flat object when sitting near midfield on the west side. And, like Ohio Stadium in Columbus, it has the old and new ring of the stadium. Nebraska’s new ring is nice, but then you walk trough entrance ways into the old part of the stadium and remember this is a relic that’s been on life support for decades. The concrete ramps and stairs are not level. Which feels weird when you’re walking up to the seating bowl. The archways and entrance ways in the ‘old’ stadium are short and I kept fearing hitting my head, which on some missed by very little. And this problem was compounded by the several entrance ways that used metal moldings on corners that were hanging loose where one could easily see someone 6′ or above being scalped. The seating areas, though, between the two Memorials were decent. Plastic covered bench seating worked well. Allowed you to space out as you wanted. Now, as for the trip itself. If you’ve read my summaries in the past, you know that travel is a big part of my enjoyment in these and other trips. I travel extensively throughout the year for both business and pleasure. I’m not a fan of flying, though. One goal I set out years ago was to visit every county in the United States. There are 3,143 of them, and I have 358 more to go, plus some more of the independent cities of Virginia. I’ve been working on this goal since 2009. It’s an interesting hobby. I get to see a lot of interesting, out-of-the-way places. It also gives me a reason to go to these places. And a lot of times, I’ll come back again, even after I’ve clinched a particular county. Prior to this trip, I had already visited every county in 2008: Delware; 2009: Connecticut and Vermont; 2010: Kansas, California, Oklahoma, Nevada, Woming, New Mexico, Colorado, and Ohio; 2011: Louisiana, Texas, Mississippi, Idaho, Washington, and Oregon; 2012: Florida, Pennsylvania, Arkansas, and Kentucky; 2013: Arizona, Utah, Nebraska, and Indiana; 2014: Tennessee. The 27th state was Illinois on the drive out. I had one county to hit in the northwest corner and made it on Wednesday afternoon. Then drove through a few empty spots in Iowa later that afternoon. Two more counties fell in Iowa on the drive to Minneapolis. And then six in Minnesota on Sunday and 5 in northwest Iowa. Then, on the drive east from Lincoln on Wednesday included the southern leg of Iowa and the remaining northern counties of Missouri to make that the 28th state I’ve complete. The map above is my current tally. Blue, I’ve driven in. The red are when I was younger or on a vacation where I wasn’t the driver. Later this year, I plan to visit the rest of Iowa and southeast Minnesota on my trip to Texas. And then also complete Alabama, southern Georgia, the rest of South Carolina and parts of North Carolina, Virginia, and West Virginia on my return trip from Florida. All told, the trip cost $1942 for two weeks out between gas, food, tickets, misc, and hotels. How can I forget food? If you’ve traveled a bit, you know there’s some good regional cuisine. Due to expediency, sit-down restaurants weren’t used that much. One time was Texas Roadhouse in Iowa, and on Thanksgiving was Golden Corral (only place open?!). However, even fast food has regional variety. And if you go to the midwest, you have to get burgers and frozen custard at Culver’s. Definitely better than the stuff you find at McDonald, Burger King, Wendy’s, Arby’s, etc. Their Colby Jack Pub Burger was exceptional. And their frozen custard is great. Cheddar’s is a good restaurant, that I don’t see in this area. The food is great home-cooked style, but very cheap for what you get. And you get a lot. Also, stay away from Runza’s. I had never had it before. But see them often in the midwest. My curiosity got the best of me and I can describe their ‘stuffed sandwich’ to be nothing but a poor imitation of a hot pocket. And that’s saying something. Horribly bad food. However, like Cheddar’s we discovered in Lincoln, there was also two places downtown. The first was Blue Orchid Thai which had great baby rolls, steamed mussels, and their Panang Curry was delicious. Prices were fairly cheap for meals, but everything else was very expensive. Appetizers were more than the meals and the desert was almost the same. The Panang Curry though, made up for it. Much rather get Indian than Thai cuisine, but it did well. And between the second and third games on the second day, was a walk southeast of the stadium to O Street, and stopped at The Sultan’s Kite. This is a little ‘hole in the wall’ place crammed into a very busy area of town. The Chicken Tikka Korma on rice was great. My girlfriend got the Chicken Schwarma Gyro, and loved it. And she’s not much of a greek food fan. The baklava was great. And not too far a walk from the stadium. The Illinois 8A Championship Game was the 99th game I’ve seen this season. It was my girlfriend’s 90th game. I still have 24 more games planned to finish out the season, minimum. First up, is Week 15. For the first time in years, I’m not attending the OHSAA Championships. It’s not necessarily the move to Columbus that dissuaded me, but partly the unjustifiably high tickets and the unneeded time spreading out the games when they’re at one venue. I was miffed that Lincoln, Nebraska had their title games spread out but each ticket was $7 and you could leave and re-enter the parking lot. Plus, there was, as listed, a lot of stuff within walking distance. Ohio Stadium has that, but I feel the prices of tickets are over-reach. Ohio’s title games are already the most expensive for someone team see all seven games. Bumping up the price further is a bit much. Plus, they could have all seven in two days and allow one ticket-per-day but have to make as much as their can on the dwindling fans who want to watch all the games. Plus, three days, spready out all day. Just not acceptable to me. And it’s not like I couldn’t afford it. However, the matchups really are few-and-far between. Athens-TCC, Nordonia-La Salle, and Wayne-St. Edward are the three of the seven that interest me. And they’re spread out over three days. A lot of recent repeats: TCC, Alter, Kirtland, Marion Local, St. Paul, Wayne, St. Edward, Coldwater. And Benedictine and CCC have been there, not to mention Minster a while ago. I like seeing fresh teams for the first time. Even if they may be overmatched: Trimble, Bellevue, Clinton-Massie, St. Clairsville, etx. So, with that said. I have another weekend out and about planned. First, on Thursday, it’s a drive to Baltimore for the Maryland 3A Championship at M&T Bank Stadium between Damascus and Franklin. Then, on Friday morning it’s a drive north to MetLife Stadium in East Rutherford, New Jersey for the North 1, Group 1 Championship between Cresskill & Verona. Then, the Non-Public Group 4 Championship between St. Peter’s Prep and Paramus Catholic. After staying the night just two miles from the stadium, is a quadruple-header. Including a game I’m interesting in: Montclair v. Passaic County Tech. If not for the Browns game on Sunday, I would have stayed out in Jersey for another day for another quadruple-header at MetLife Stadium. However, I plan to drive back to Cleveland after the NJ game ends around 10pm for the 1pm game in Cleveland. I did this two years ago. It’s a little tiring, but it’s managable. The drive home from Cleveland though is a pain. If I stayed out in Jersey for the Sunday games, I’d just head home on Monday. Week 16 is the four championships in Hershey, Pennsylania. Possibly seeing the PSAL Championship at Yankee Stadium on Tuesday. Though, I really need to work at least one more week the rest of the year. Because after the PA titles, I’m off the rest of the calendar year. Week 17 is a drive to Arlington, Texas for the 10 UIL Championships. When they’re over, it’s a drive east to Fort Lauderdale, Florida to spend Christmas with my girlfriend and her family. There’s three games in Week 18 in Florida as part of ESPN’s “State Champions Bowl Series” featuring state champions from Florida, Washington, and Utah at FAU Stadium in Boca Raton on 12/27. Then, it’s a three or four day drive back north. So far, in the past five years, I’ve seen 427 high school football games in 30 different states.